Where would Judaism be without music? We remember blessings and prayers through melodies. We celebrate through song. As much as music is part of the Jewish experience it is part of life at Krieger Schechter Day School. Kindergarteners discover the connection between music and feelings. Fourth graders learn about jazz and the blues. Whatever the lesson, music for its own sake is part of the KSDS curriculum. It’s also integrated into the dual curriculum as students sing and perform to enhance understanding of subjects from math to social studies to Judaics. By 8th Grade, students have sung dozens of songs and explored as many instruments. They’ve also performed vocally in grade-wide annual plays in English and Hebrew. 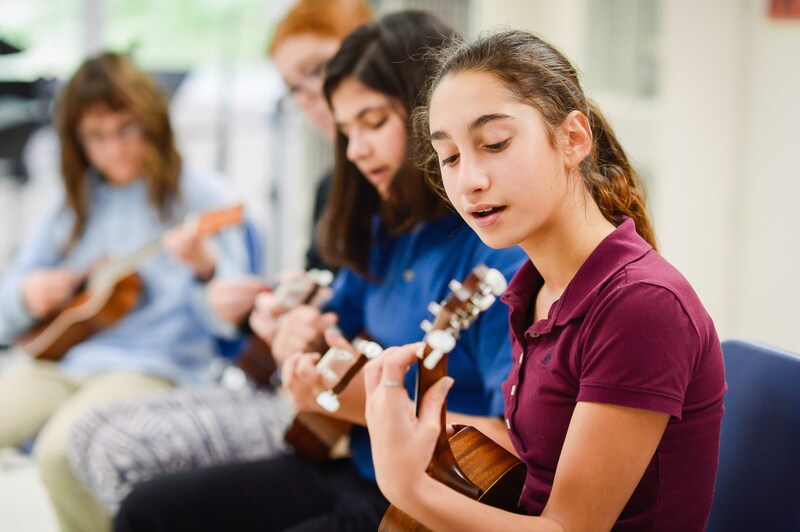 Browse the Lower School curriculum and Middle School curriculum for grade-by-grade information on music education at KSDS. Any 3rd or 4th grader who wants to sing can join the Lower School Choir. No audition required! Directed by music teacher Sara Fuld, the choir meets once a week for a half hour during school time. Members learn a repertoire of secular and Judaic music in English and Hebrew. The director stresses skills such as tone, posture and diction. The choir performs at various school events. In some years the choir performs outside school. Past venues have included Jewish Family Services, the Owings Mills JCC, local senior centers and the Governor’s Mansion in Annapolis. The Middle School music teacher develops and directs instrumental ensembles that change based on students’ talents and interests. Past groups have included a rock band, a guitar ensemble and an Orff ensemble featuring xylophones and glockenspiels. Whatever the director likes–and the musicians can handle–goes! Ensembles perform at various school events through the year.